We are honored to offer the “Berger,” an extraordinary Golden Period violin by the great master, Antonio Stradivari. Instruments created during the height of the legendary maker’s career have been coveted by leading artists and collectors since their making and are exceedingly rare, with acquisition opportunities often coming but once in a generation. Stradivari had experimented with several different styles over the years when, around 1700, he made the decision to move away from the long pattern he had favored in the 1690s. With a reduction in the back length and changes in breadth and arching as well as the bold and costly use of a more highly-figured, imported maple, Stradivari perfected his model, which has profoundly influenced violinmakers since that time. Crafted at the beginning of this landmark period, the “Berger” has the iconic tonal beauty, brilliance, richness, and power that distinguish the foremost instruments by the celebrated maker. It is with great pleasure that we welcome the “Berger” back to our firm once again. Isador Berger, the violin’s namesake, was a violinist, collector, and professor from Chicago. He studied in Europe with the renowned virtuosos and pedagogues August Wilhelmj, Émile Sauret, and César Thomson. Berger served as a member of King Albert’s Royal Court Orchestra in Brussels, the Chicago Symphony, Chicago Grand Opera Orchestra, and the Chicago Civic Opera Orchestra as well as concertmaster of the Chicago Philharmonic. He was on the faculty of Chicago Musical College beginning in 1911. Over his esteemed career, Berger owned several outstanding Stradivari violins, including this exceptional instrument. The “Berger” was featured in the September 1936 edition of The Strad, where it was noted that the violin had once been the property of famed Belgian violinist, composer, and teacher Charles Auguste de Bériot. According to the article, in 1874 the violin passed into the hands of de Bériot’s most celebrated protégé Henri Vieuxtemps for five years until he relinquished it to Guillaume Brochon, his friend and pupil, in 1879. The “Berger” was then acquired by a Monsieur Salis of Paris. The Salis family retained ownership until violist Jean Salis brought the violin to Chicago. Salis became a member of the Chicago Civic Opera Orchestra and sold the instrument to his colleague, Isador Berger. 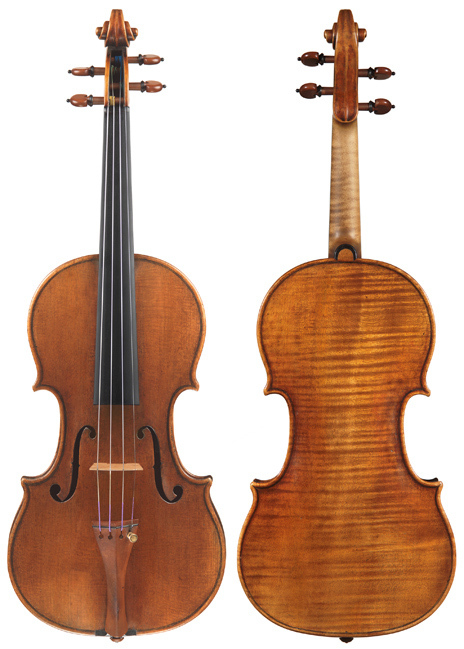 In 1936, English dealer Ralph P. Powell purchased the violin from Berger. A little more than half a century later, the “Berger” was acquired from Bein & Fushi by a distinguished connoisseur in whose possession it has remained. The violin is described in Ernest Doring’s 1945 How Many Strads? Our Heritage from the Master as the“De Bériot Stradivari of 1700”and illustrated in Herbert Goodkind’s 1972 Violin Iconography of Antonio Stradivari. Both W.E. Hill & Sons and The Rudolph Wurlitzer firms provided certificates of authenticity for the “Berger” in the spring of 1933. We look forward to placing this superb Stradivari with another eminent collector or leading artist.